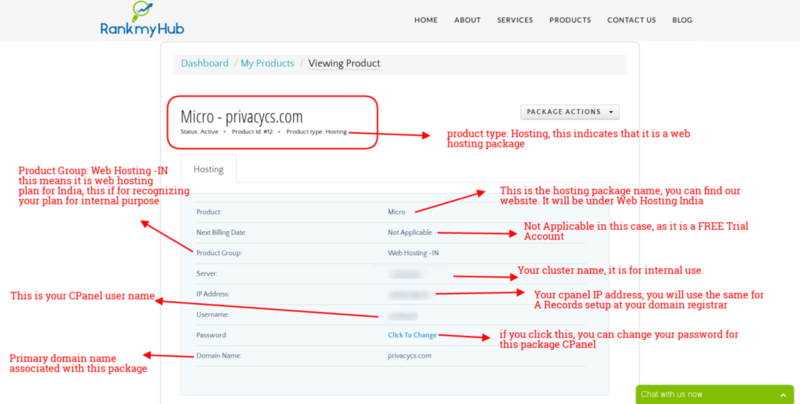 In this article, we will walk through the Product Management and Product list options in the Web Hosting dashboard. I assume that you have already logged into the web hosting dashboard or client area on our website. Please see the screenshots below to get some idea. Under the Product list, you can see the list of packages with their ID, Package name, Next Due Date, Billing Cycle, Status, and Actions. ID: This is product identification or reference number, it is just used for our internal purpose. Package: This field shows the list of package names and descriptions under your account. It also links to the package details page, which shows more information about the package. 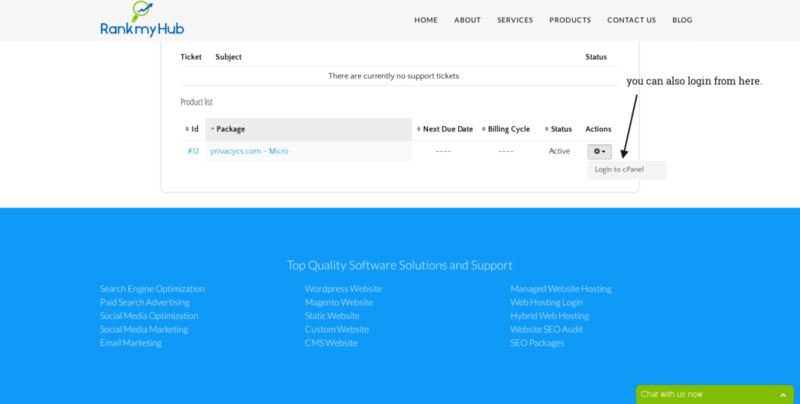 Next Due Date: This field shows the packages that are due for next billing date. It depends on how the payment method is chosen, recurring billing or one-time billing. If you are a FREE Trial customer, you will exactly see the screenshot above, because Trial accounts are not attached to invoices. 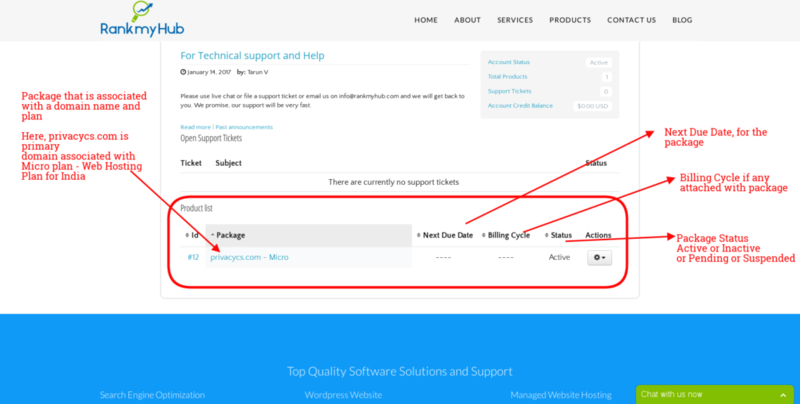 Billing Cycle: This field shows the packages billing cycle, like Monthly, Annually, Miscellaneous and One time. Status: This field shows the package and its status. In the screenshot above, we can see that status is Active. It means, the package is successfully linked to our servers by us and it is in running mode. How to know more information about your package? Step 1: See the instructions in the screenshot below. Click on the package link and wait for the package page to open. Step 2: After you click on the package name, it will open a new page with complete package information. Refer to screenshot below for details. The most important details are IP Address, Username and Password. IP address displayed above is the IP address of your cpanel. It is the IP address, you need to enter to setup A records at the domain registrar. Username: This is your CPanel, username. It is important that you note down this on your computer or memorize, as you need it all time to access your CPanel directly from the alternative login. Alternative login URL is sent to you by our support team during your package activation. We highly recommend you to use it to login to CPanel and do your work. 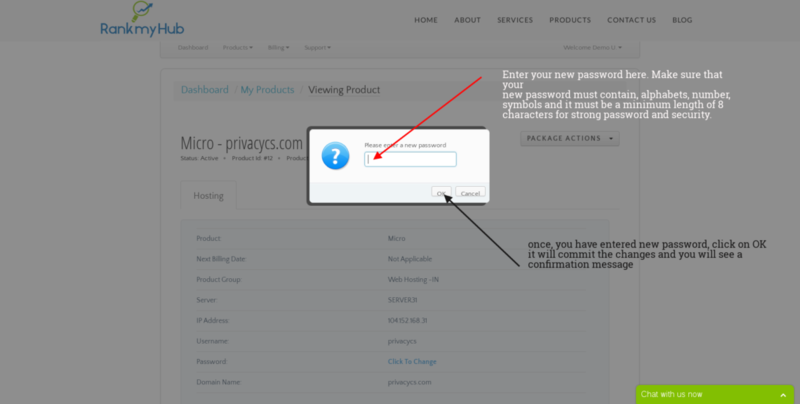 Password: For security reasons, we will never display your cpanel password in your account area. But if you wish to change your cpanel password. You can click on the “Click To Change” link as seen in the screenshot. It will open up a dialog box like the screenshot below. You have to enter a very strong password, to change your control panel login password. We recommend the following security strength for safety. a) Choose a minimum of 8 characters. b) Include alphabets (a to z or A to Z or both upper and lower case is much better). If you follow the 4 simple instructions above, you can choose the best password, that is hard to crack. Always remember, your security lies in your own hands. Although we have best firewall and virus protection systems, you must have a basic security that is strong. Never share your CPanel password with anyone, we will never ask you to share. 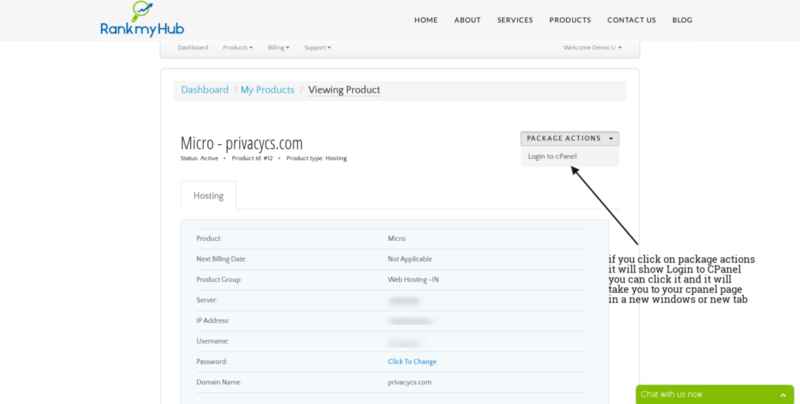 You can click on the PACKAGE ACTIONS button, it will show up a new menu item “Login to cPanel”. If you wish to login to cpanel. You can click the link, it will open your cpanel account in a new window or new tab. Note: We highly recommend you to use direct or alternative login URL sent to your email id for hassle free and secure access. Login from your dashboard only, if you are in need to do this way. You can also do this action from dashboard package listing page. See screenshot for reference. However, we do not recommend logging into cpanel from account portal. Please use alternative URL whenever possible, for more security. This completes the package management and product list options usage on customer portal. If you need any help, contact our support team. Thank you.